Hidalgo Gas Plant - West Of Orla, TX. 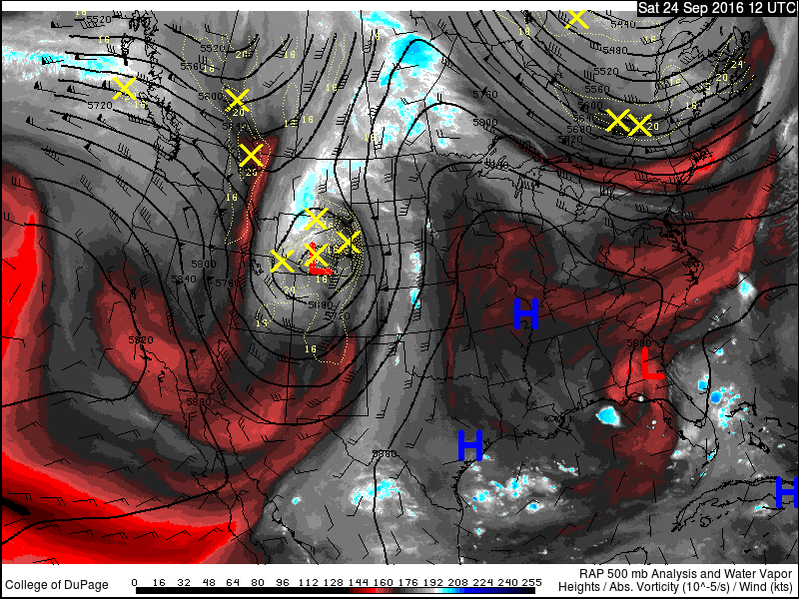 Strong Western Storm Digs South Today. 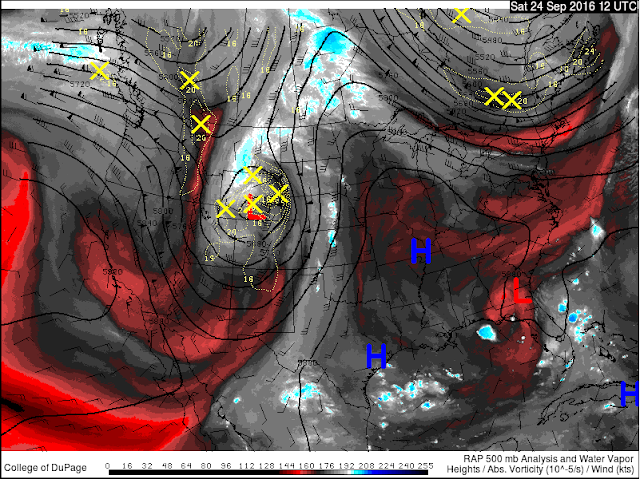 500 MB Analysis @ 6 AM MDT This Morning. A strong storm centered over southern Wyoming at sunrise this morning will continue to lift off to the northeast today. 06Z/Midnight Last Night GFS 500 MB Forecast. Valid @ 6 AM MDT Monday, September 26, 2016. Meanwhile at the base of this storm a piece of its energy will drop southward into eastern Arizona and western New Mexico sunset tonight. 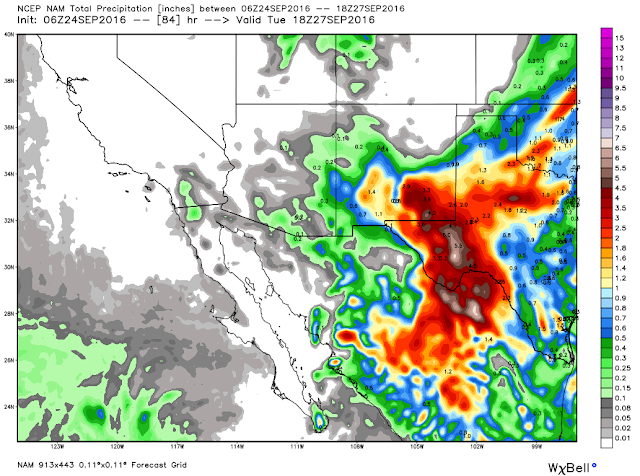 A cutoff upper level low will develop just south of Arizona on Sunday and will still be parked there by sunrise Monday. 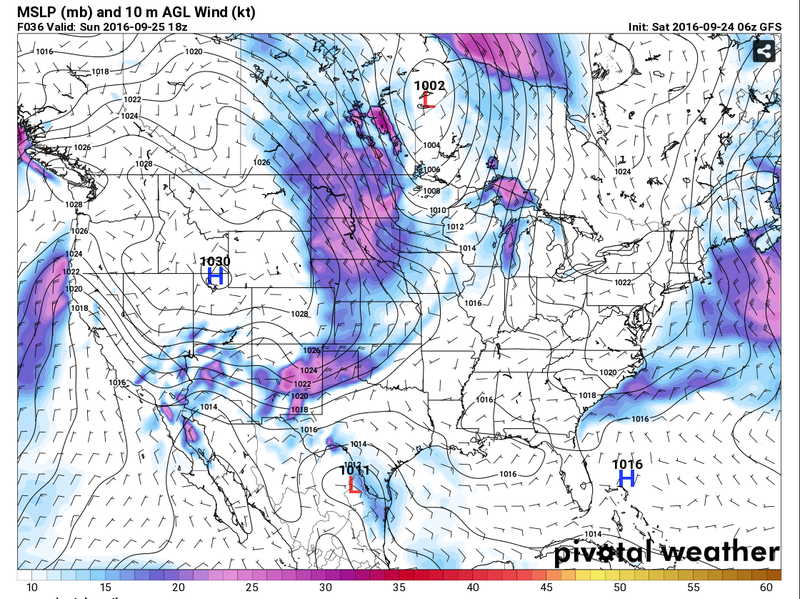 This cutoff low depicted here at the 500 millibar level or roughly at 18,000' above sea level will have been "cutoff" or separated from the jet stream to its north over the northern plains. Therefore it will just sit down there for a couple of days and spin away trapped by the upper level ridge by its west and north. Cold This Morning Across The Western U.S. Without a doubt it feels very much like fall across the Western U.S. at sunrise this morning. 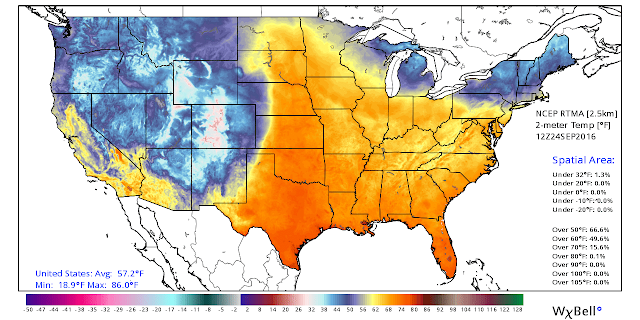 Notice the widespread temperatures in the 30's. (As Of 7:30 AM MDT). 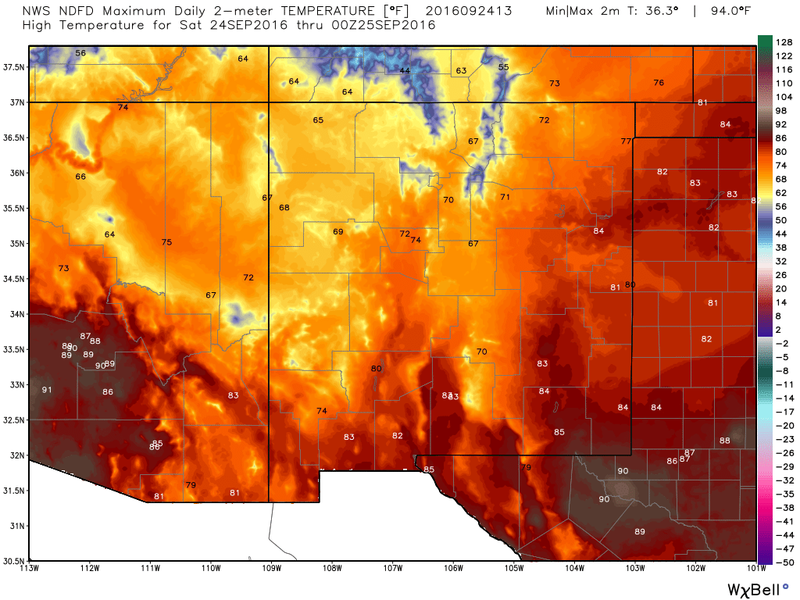 NDFD NWD Forecast High Temperatures Today. 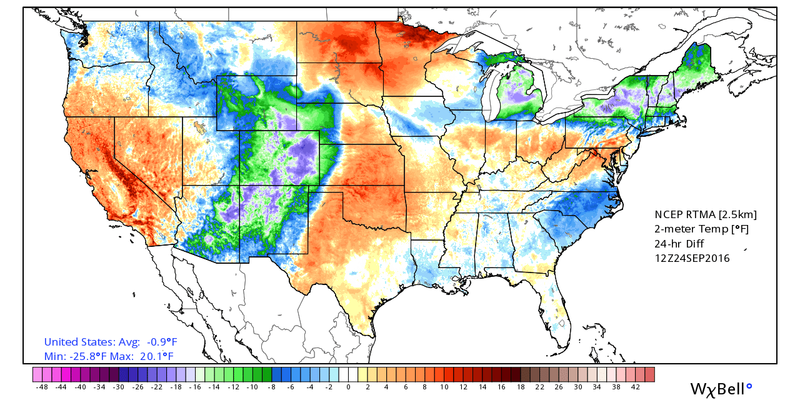 Today will be the last day with high temperatures above normal for about the next week. Most of southeastern New Mexico will see the low 80's this afternoon with some locations in West Texas flirting with 90ºF. 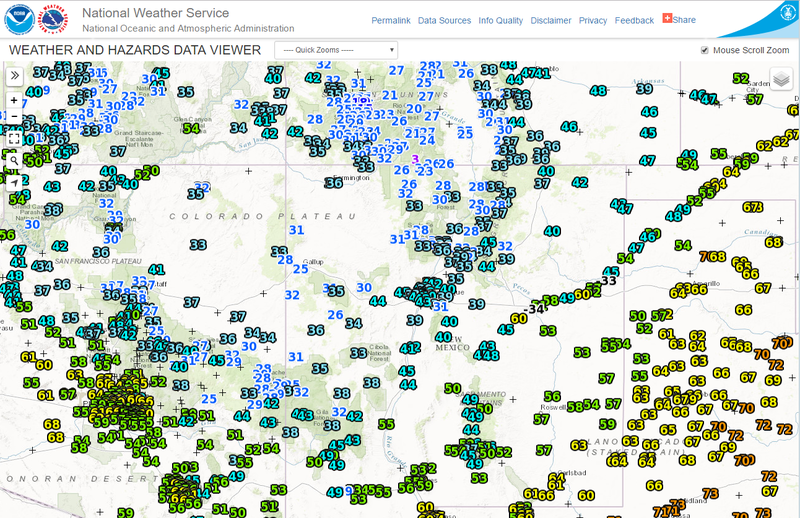 The higher elevations of the northern New Mexico and southern Colorado mountains will only be in the 40's. Thunderstorms Breakout This Afternoon - Main Show On Sunday. 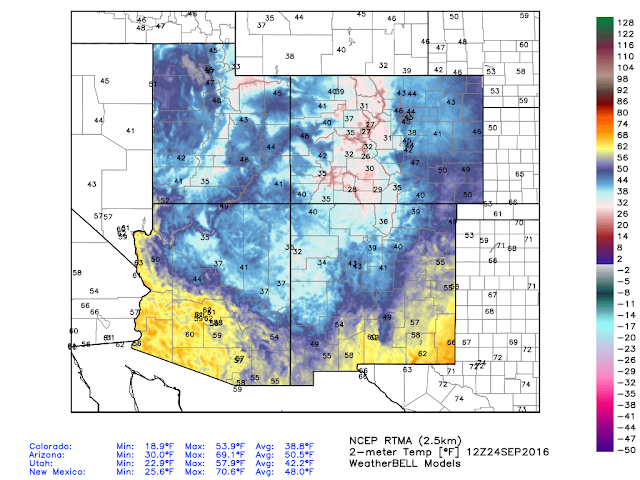 Valid @ Noon MDT Sunday, September 25, 2016. 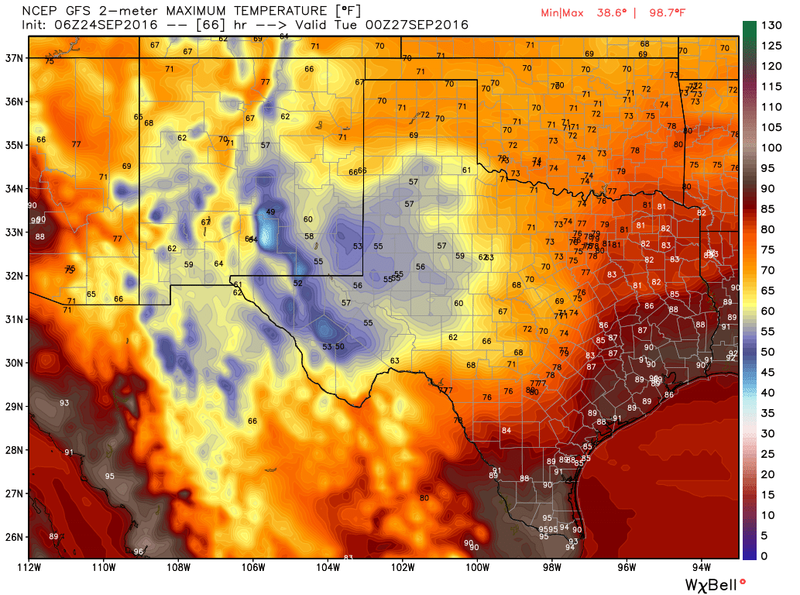 GFS Forecast High Temperatures For Monday. 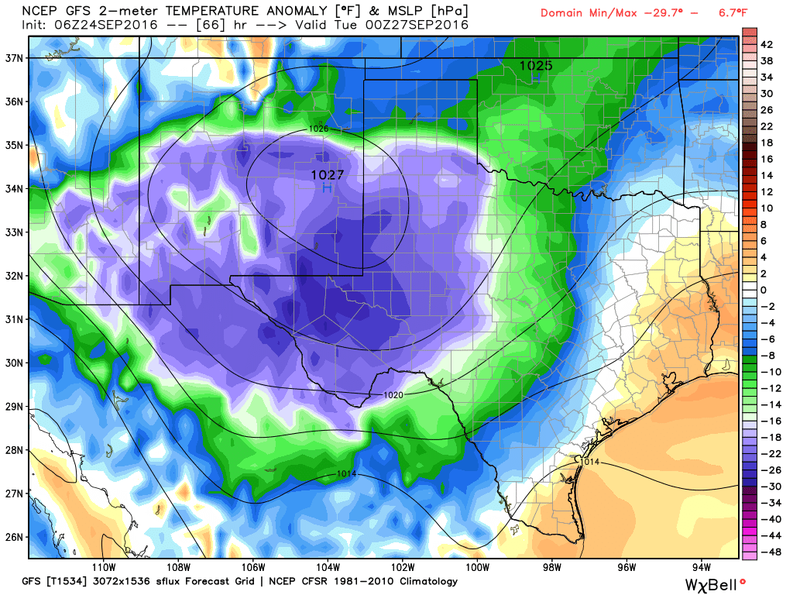 GFS Forecast Temperature Departure From Normals On Monday. A strong cold front is forecast to slide southward into the local area late tonight into Sunday morning. There still remains some question as to exactly when the front will arrive in southeastern New Mexico. 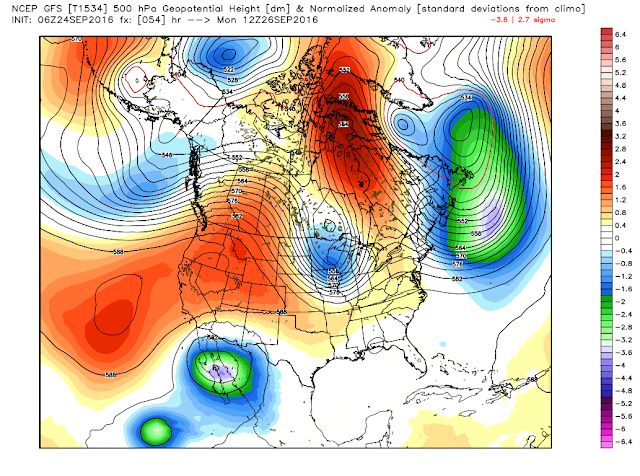 Should its passage occur early enough Sunday morning then our daytime high temperatures will be in the 50's with some locals seeing 60ºF. If it arrive later in the day then we will be somewhat warmer. At any rate Monday still looks to be a raw, wet, blustery and chilly day with most of us only seeing the 50's for high temperatures.These readings will be some 20 to 30 degrees below normal. 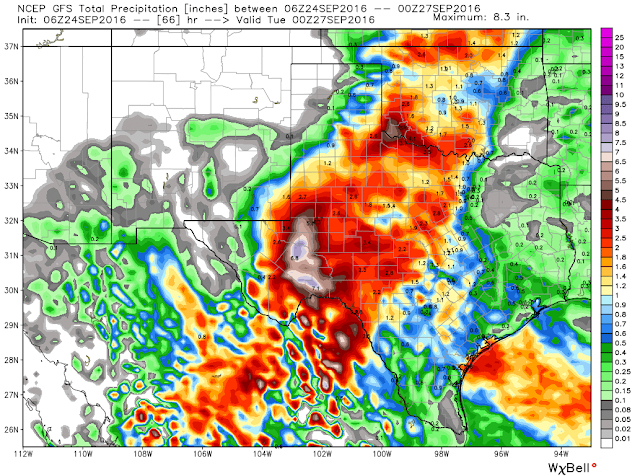 Heavy Rains Still On Track To Fall. 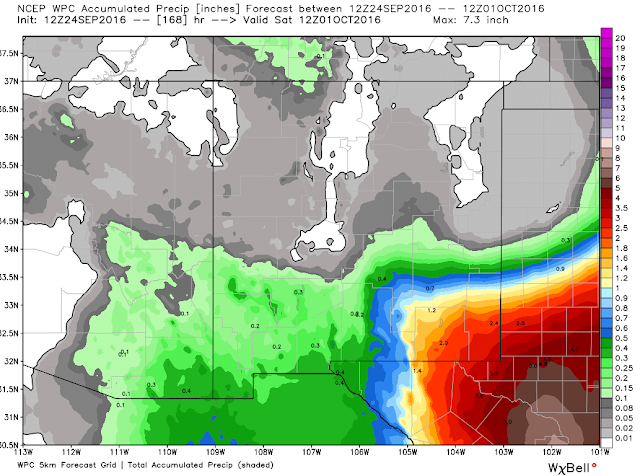 NDFD NWS Storm Total Rainfall Forecast. 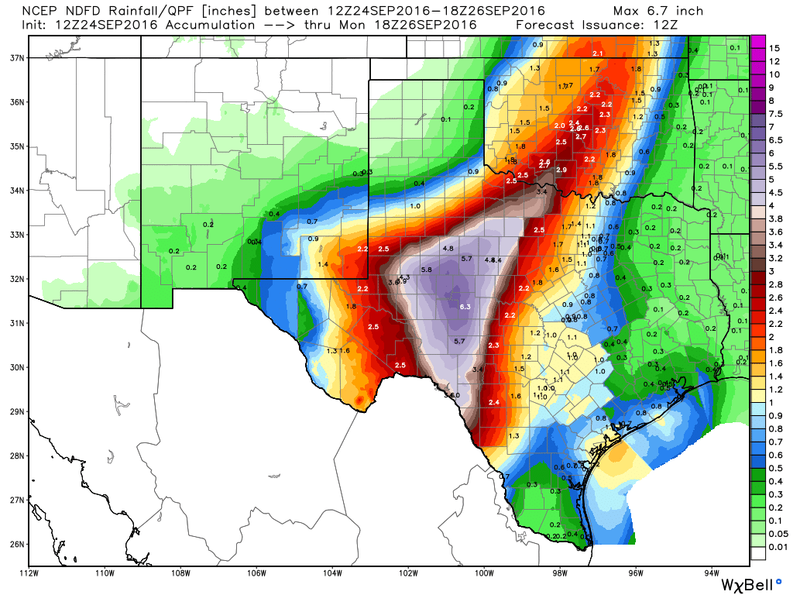 Weather Prediction Center (WPC) Storm Total Rainfall Forecast. Valid @ 6 AM MDT Saturday, October 1, 2016. 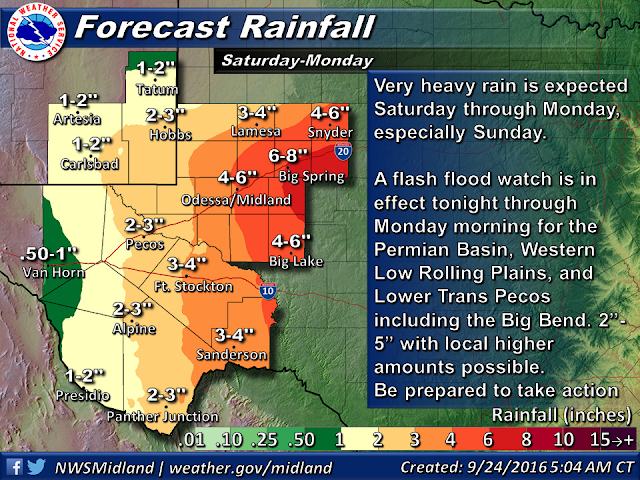 Midland NWS Storm Total Rainfall Forecast. 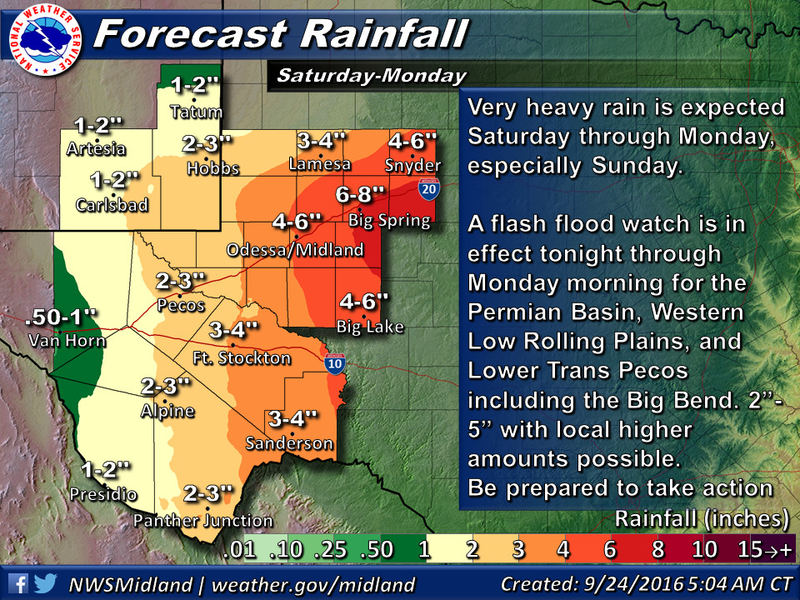 A Flash Flood Watch is now in effect for parts of West Texas including the Lamesa, Andrews, Midland/Odessa, and Fort Stockton areas from this evening through Monday morning. Heavy rains from slow moving training thunderstorms and steady heavy rains are forecast across the area tonight into Monday. At this time the heaviest of these rains are forecast to fall east of southeastern New Mexico with some parts of West Texas in the Big Springs area possibly seeing as much as 6" to 8" of rainfall by Monday morning. However any subtle shifts in exactly where the cutoff upper level low to our west that may or may not occur will have an impact locally on our storm total rainfall amounts. We could easily end up with more than what is being forecast or less depending upon just where this storm parks itself. So be alert for the possibility of Flash Flooding in southeastern New Mexico as well. A Few Marginally Severe Thunderstorms will be possible across the area this afternoon and evening but for now it does not appear that we will see severe thunderstorms at the magnitude and strength that they reached last Thursday and Saturday.